That file basically turns on freepats and then points to your home configuration. Timidity lets you "cascade" sounds, so activating freepats will ensure that you have some kind of sound for most of the banks accessed by your midi files. Any patches/soundfonts you later specify will override those previously specified. The dir command just "activates" a given directory so that I can then call the configuration files in it by their basename as shown. With this configuration, I can set up lots of preconfigured sounds that I can easily turn on and off in my "master" configuration file. # only in Ubuntu 9.04 or earlier !! At least for Karmic and Lucid (9.10) you will need to follow instructions here to install swami. Some guy is working to get GTK2.0 integration at which point we'll probably see the package surface again. Again, the "dir" command "activates" the directory that contains my Blanchet-400_ver.1.0.sf2 soundfont file so I can access it in my file by its base filename. The bank 0 is now specifying which instrument sounds we are going to provide for midi files that access bank 0 (which is most of them since bank 0 is the main bank). midi_instrument: the program change found in the midi file. The General Midi (GM) typical mapping (note: timidity starts numbering at '0', so you need to subtract '1' from each of these to specify them in timidity). %font: means this is a soundfont (patches don't require it), then . So, here I've mapped the first harpsichord manual (bank 1, instrument 1) to instrument 6 ("harpsichord" in GM), the second harpsichord manual (bank 1, instrument 2) to instrument 7 ("clavinet"), the lute harpsichord sound (bank 1, instrument 3) to instrument 9 ("Celesta") and the sound with both harpsichords (bank 1, instrument 4) to instrument 10 ("Glockenspiel"). Now, a midi file that has a "program change" (instrument) specifying a harpsichord will access my first harpsichord manual and so on. Let me know if you have any questions/troubles and I'll try to update this post to answer them. Thanks for this...it's a really good guide to a program that even by Linux standards is a bit shrouded in mystery. Do you know how to add percussion to .cfg file? Nicholas, I've never actually used drums before with timidity (so far just for classical). I've found that "MIDI Channel 10 is for percussion" so that might help. Maybe that will be enough to figure it out. I would love to hear how it works if you figure it out and will certainly post it inside the main post so others can benefit. Hey, thanks for this, I have been scratching my head for days trying to work out how to to switch in a particular instrument soundfont. This did the trick. Still a few things. I want to install the FluidR3_GS.sf2 soundfont. Do I follow you correctly that I need a .cfg file to map out all the instruments appropriately? Short of doing this by hand, I assume that I should be able to get a cfg download from somewhere? Help? >> Do I follow you correctly that I need a .cfg file to map out all the instruments appropriately? yes, timidity has to have a config file that already 'knows' about the soundfont. >> Short of doing this by hand, I assume that I should be able to get a cfg download from somewhere? If one isn't already made, you do have to go in by hand and create the config file. Using swami (or similar) it isn't too difficult. I poked around swami to see if I could output some kind of text file describing the soundfont which could be used to generate a config file automatically. No luck. Does anyone know how to programmatically get instrument banks and patches out of a soundfont? I'd be very interested in a solution. Someone could alter the swami code to do this. Or, if soundfont formats are fairly straightforward, one could decipher and 'unpack' the binary using ruby/perl/python. >> the best sound font ... Any leads you can offer? I've collected a variety of free sound fonts over the years but haven't played around with them enough to recommend a single one. So far, I have tried to stick with one instrument at a time (rather than the compilations). merlin_plus21 seems pretty good. Anyone else have a recommendation? Thanks for this very-good-explained guide! First of all: thank you for this wonderful howto. I set up a configuration along your lines, and it seems to work very well, just tested it. I wonder if you could help me with the following: I just bought a USB MIDI keyboard and would like it to sound like the Blanchet-1720 soundfont. But so far it only sounds like a piano. That means that the connection works. 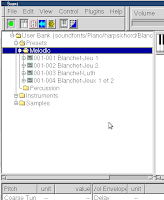 But I am unable to say if I need to configure the keyboard now to use the Blanchet soundfont, and unfortunately the manual is written in terrible English, so it is not of much help. It is a pretty simple keyboard without bells and whistles and, it seems, without anything preinstalled on it. Is there an option in the config file of Timidity to boost the volume of the fingered bass for example ? I use the Shan's soundfont (SGM-V2.01.sf2). How I can do it ? See http://manpages.ubuntu.com/manpages/hardy/man5/timidity.cfg.5.html for more modifiers.